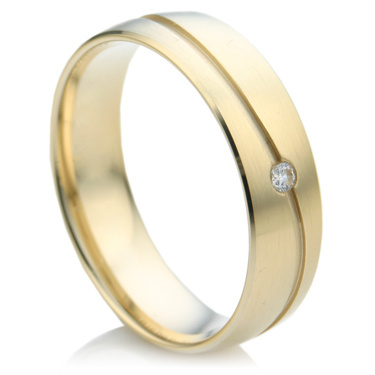 This wedding ring is the woman's ring in the pair. The ring is set with a brilliant cut diamond. The diamond is set into a wave channel that circles the ring. The channel is polished and is set against the matte finish applied to the rest of the ring. The diamond is a 0.02 carat stone. Together these two rings are a great combination. These rings are available in 18k, 14k or 10k yellow gold, select your metal below.You can purchase the rings individually or together. To purchase individually, please follow the link below.